>If you missed yesterday’s post, “It’s a Red Letter Day” (brought to you by the Letter “A”) you can just scroll down to the post just below this one to catch up. “B” is for BLOOD. I’m especially conscience of the importance of blood today, since I fasted for almost 24 hours before having three big tubes of blood drawn at my cardiologist’s office this morning. The lab work from my annual physical in December showed a slight elevation in my cholesterol, so my husband—an internist who specializes in hypertension and preventive medicine—wanted a re-check. Especially since I always have good lipids and low blood pressure. On top of that, I had been dieting, exercising, and my resting pulse is only 60. All things considered, he wondered if there might have even been a labor error. So, before allowing my doc to put me on Lipitor, off I went for a more comprehensive evaluation… of my blood. Blood is essential to our life. 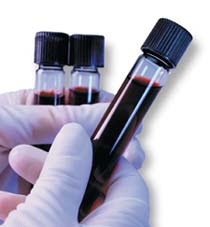 The average adult body contains about 5 liters of blood, or about 1/5 of its total body weight. It’s a living flowing organ. Over 3 million red blood cells are made every second. But wait, isn’t this a series about Lent? What does blood have to do with spiritual things? Everything, because we are physical beings. 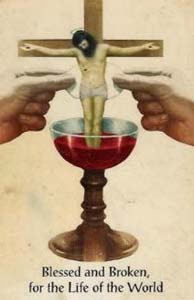 Ever wonder why some Christians sing, “Are You Washed in the Blood of the Lamb?” The concept comes from many places in Holy Scripture, including Revelation 7:14: “These are the ones who come out of the great tribulation and washed their robes and made them white in the blood of the lamb.” While beliefs vary from denomination to denomination as to just HOW Jesus’ blood saves us, the common belief is that it does, in fact, save us. And of course “B” is also for BREAD. 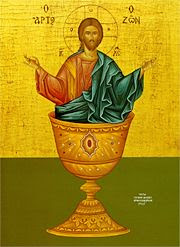 Like this icon, which is called, “Christ the Bread of Life,” the bread we share from the chalice during the mystery of the Eucharist is also that living bread. How? Like the wine and the blood, it’s a mystery. 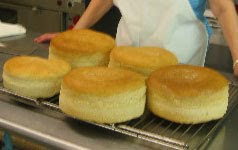 And while I’ve been one of many women who have baked the prosfora (holy bread) that is used for communion services at my church for many years—mixing together the ingredients that come from the earth: flour, water, yeast—I have also witnessed the miracle that happens during every Divine Liturgy when the bread becomes the Body of Christ. I don’t hunger for this life-changing bread nearly as much as I should, but during Great Lent, when I make even a small effort to fast, I find myself a little bit hungrier for God. Next up? “C” is for….